Seriously. The size of that thing. 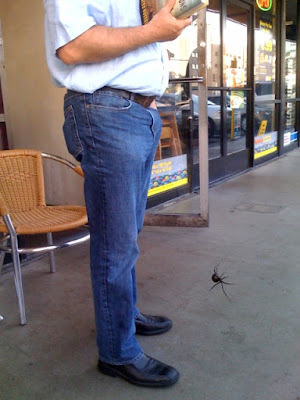 We had to get a photo, and then--sorry freakishly huge poisonous spider!--kill it. Apologies to whoever that guy is who got his pants caught in the photo, and I hope you enjoy that second book from the bestselling author of THE KITE RUNNER. WHY WOULD YOU POST THIS?!!? This is like when im flipping through channels trying to find a "Rock of Love" marathon and there's special about giant tumor surgeries. UGHHHH!!! I CAN IT CRAWLING ON ME. GAWD!!! Why are the bees dying and not these fuckers?!? Seriously what do these assholes do?! ?